Awesome start to what will be an awesome day! Thank you for entering me in this contest! I loved Chasing Brooklyn. 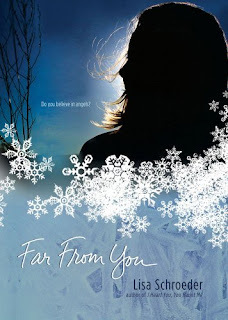 I'm sure Far From You is just as great. Oh, please enter me too! Please enter me! Thanks for all the contests today! I don't know how you do it!! Signed! SIGNED! I have to have this! You make reading so exciting! Is it okay to enter every giveaway? Missie, yep you can enter as many as you want!!!! There is a lot planned, plus the ones from last week that are still going on! Good luck! Would love to enter this one! Thanks! heck yes! and how awesome is the cover?? Love Lisa Schroeder but I haven't been able to read this one yet. Awesome, I've never seen this book before but it's on my wish list now! This one looks so good! I love the cover. This looks good! Thanks for the contests! Love Lisa, so count me in. This one sounds like it could be a tearjerker, but I still want to read it. yes, this one does sound like a tearjerker. Got my box ready! Another one that looks fantastic. I love love love verse novels, and I can't wait to read this one. I love novels in verse!